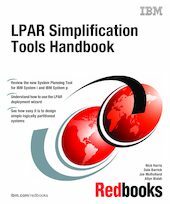 In this IBM Redbooks publication we summarize the new functions designed to simplify the process of planning for and deploying logical partitions (LPARs) on the System i and System p models. The new LPAR Simplification functions include the new System Planning Tool (SPT) and the new Deploy System Plan wizard on the Hardware Management Console (HMC). This book focuses on System i. The System Planning Tool is the replacement for the Logical Partition Validation Tool (LVT). It provides the configuration mechanism for designing LPARs on System i and System p systems. This document covers the installation and use of SPT. The new LPAR deployment wizard is a function of the HMC and provides the capability to take the configuration produced in SPT and use it to create an LPAR configuration on the HMC managing the system. This significantly simplifies and reduces the work effort to create LPARs. The design work is done once in SPT, whereas the deployment or redeployment can happen many times. This book provides guidance information for IBM and IBM Business Partners who help customers plan, order, and deploy systems.